The iPad is getting more than its fair share of press, I think — or to be precise, it’s getting its fair share, but a lot of it could have gone to any other quality tablet device, of which at the moment there are admittedly few (the Adam comes to mind). So these days, when I read an interesting article like this one, or write that someone is making an iPad tablet version of their magazine, I deliberately conflate the terms “iPad” and “tablet.”To their credit, Apple is making a very robust reader app that’s ripe for exploiting, as Craigmod says, as a canvas for rich media. I’d never pretend that the iPad is the be-all and end-all of tablet devices. For one thing, it’s deliberately incomplete, and Apple’s plan for the iPad v2 is spelled out in the hardware for anyone to see. But it’s still going to be first to market with an attractive and functional device, which is more than others can say. It seems to me, though, that content created for an iPad is created not just with Apple’s hardware in mind, but with the whole tablet form factor in mind, and come Chrome OS and all it brings, I guarantee we’ll see a huge amount of what used to be exclusive iPad functionality duplicated — and for a lot cheaper. But to return to the book discussion: I like the idea of content made just for tablets — the “infinite content plane” in particular, was something I hoped Apple would leverage as a “desktop” for the iPad. Not so much. But the ingenuity of designers can always be relied on when you have something like an entirely new form factor to play with — and you aren’t risking the future of a multi-billion dollar company on it. Distinguishing between formless and definite content, as they are termed in the post, is also important. 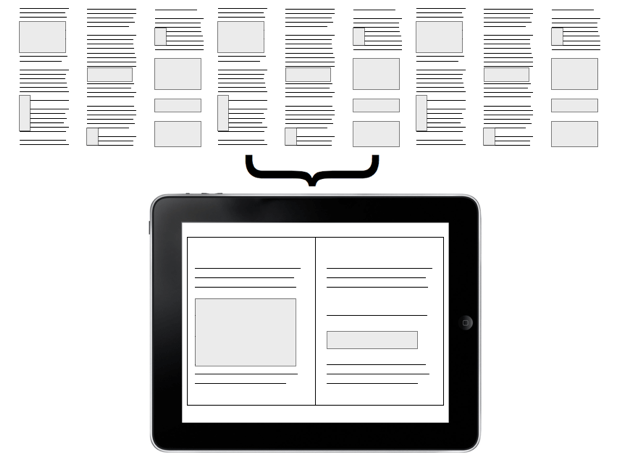 Well-designed web pages are the best template for laying out a book for a tablet — they’re definite, but still flexible enough to accommodate things like size and orientation. The potential for improvement of a format we’ve taken for granted for centuries is not to be passed up. I mean, we get a new entire way of consuming media and then we make people turn virtual pages? But I’ll leave that to the designers. Read the post, it’s good. I particularly agree about the point that the elimination of crappy paperbacks is progress.